Oh - yeah... since a long time I am ready to participate another Mixology Monday - I am so excited. This time - it is a quite easy going subject - Summer Break. This MxMo is hosted by Joel DiPippa of the Southern Ash blog - thanks so much! Here in Dubai the seasons are slightly different than let's say in Arizona. The weather is changing from slightly chilly spring or autumn temperature (winter), to full blown summer temperatures (your spring or autumn) - to seriously insane "sous vide" temperatures in the summer. Winter is never seen here. Due to this point drinks you will be able to offer 10 months in a year some summer drinks - and the 2 remaining months you are mixing mulled beverages - basically only because of their novelty (but on the side, you still make summer drinks) - if there is no rain (a felt 5 days a year) - sandstorm, or really "strange bad weathers", even on the coldest day in the year, you will have comfy "above 20ºC" over the day. But as we all come (more or less) from countries with more confined seasons, we do exactly what the topic is all about. First of all we look at Aurelien's suggestion, who works in the exciting beach restaurant Palm Grill. The Margarita, is such a classic drink for warm weathers that we can enjoy in many different ways; like on the rocks, frozen or strain into a chilled glass. So I did the difference using strawberry/chili infused tequila which got to give us a real distinct taste but also gives us a nice red color. Instead of a salt rim my goal was to augment the taste with the combination of acidic lemon salt and sugar, which is balanced and supercharged with the addition of bicarbonate of soda to give the last touch by providing a fizzy effect as soon as you take the first sip. And yeah - I know - some people would remind me, that I always talk trash about blue drinks... but there is a difference: it is not necessarily the colour - it is the fact, that blue usually means artificial - and this is really my main point of dislike. 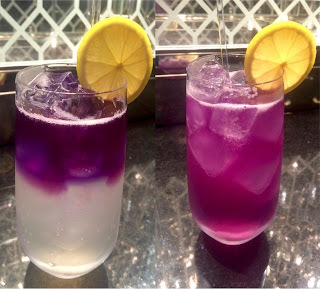 However there is something like "butterfly pea tea" (butterfly pea - is a shrub with blue blossoms), which can make a drink in a shade of blue... until it becomes acidic - then it turns purple or red.... a colour changing cocktail - based on natural only ingredients? Sign me up. Meet the Butterfly Collins... a slightly more floral variation of a Tom Collins; floral though doesn't mean, that it is more feminine - with Plymouth Navy it is as "gin'y" as it gets - and it is blue'ish purple - and it is just totally G&T'ish. Infuse the gin with the tea bag. Add ice cubes into the glass and add lemon juice and syrup and stir. Add club soda and stir carefully stir again. Float with the "purple-blue-infused" gin. A drink, straight forward enough to have in any season. A blend of aged Solera rum, paired with mild fruity flavours of banana & cocoa. The complementing aromas with the support of a gentle sweetness would entertain perfectly a gloomy spring afternoon. Or just imagine a calm & serene beach, sipping the drink in a cocktail glass - the rums' warm soul making it a perfectly cozy embrace.